I don't really have a lot of rituals when it comes to dealing with my grief. 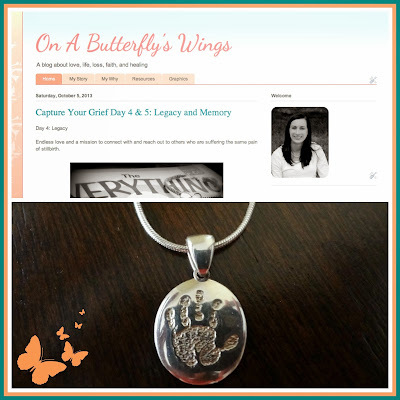 I think the closest things I have to rituals right now are every morning I put on my necklace that is made with Emma's actual handprint and I have this blog to journal my feelings and experiences. I started to follow your blog. I'm very sorry for Emma. I have lost my baby girl as well in August, full term, first daughter, c-section as you did. Sorry to have to say we have very similar stories. I really like to read your blog and I find a bit of peace, I hope we can go through our grief together. I will follow you and hope the best for both of us. I love our necklace. I wonder where did you buy it, maybe online? I don't know where you live, however I'm looking for something really similar. 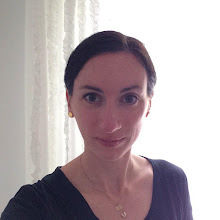 Thank you so much for stopping by my blog and leaving a comment. I am so sorry for the loss of your daughter. Although its terrible to know that someone else has lived your same story, I have found it comforting to connect with others who have a similar story to me as it helps to not feel so alone. You can feel free email me anytime (I just added an email button to the side of my blog). My necklace is called a Thumbie and its from a company called Meadow Hill. I'm not sure where you are located, but you can check it out online and see if its available. If you have a handprint or footprint you can scan it and they will create the necklace (our funeral home did it for us).